Hundreds of broken tree limbs clutter hiking areas at Sleeping Giant State Park in Hamden. 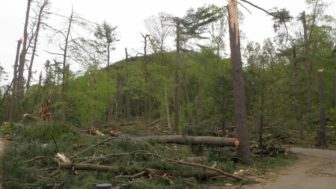 Washington – The White House on Monday agreed to provide some, but not all, of the assistance the state requested to help the victims of May’s severe storms and tornadoes. If the individual assistance request is approved, homeowners may receive up to a maximum of $34,000 in federal grants for costs related to uninsured damage to their properties. The governor also asked for help from a Small Business Administration disaster loan program, which provides low-interest loans to affected residents and businesses in disaster struck areas. Litchfield County was also affected, but had not completed its damage assessment when Malloy asked for FEMA’s help in July. The May 15 storm, which spawned a number of tornadoes and produced tennis ball-sized hail, caused significant damage in Brookfield, Danbury, New Milford, Newtown, Oxford, Ridgefield, Southbury, Winsted, Bethany, Hamden, Cheshire, Durham, Seymour, North Haven, Beacon Falls, and Wallingford. “We will continue to urge the White House to approve direct aid to individual homeowners—a request still under review,” the delegation said.